In a bold bid to revive President Bush's multibillion-dollar financial rescue plan, Senate leaders scheduled a vote for Wednesday night on a version of the bill that adds substantial tax cuts meant to appeal to Republicans when it reaches the House. The goal is to net at least 12 more House votes than the rescue proposal received Monday, when lawmakers rocked the political and financial worlds by rejecting it. The gambit is certain to anger some conservative House Democrats, who object to tax cuts that are not offset with spending cuts. But Senate strategists assume it will gain more House votes than it will lose. If so, Congress would be poised to pass landmark legislation giving the government billions of dollars to buy deeply discounted mortgage-backed securities that are choking off credit and roiling the markets. The strategy is risky because some House members might see it as a high-handed move by senators. Senate passage of a bailout measure has seemed assured all along. The showdown is in the House, but now the Senate is trying to force the House's hand. Sen. Charles Schumer, D-N.Y., called it "a brilliant move" that will "help pick up votes on both sides of the aisle." House Speaker Nancy Pelosi's reaction was much cooler. "The Senate has made a decision about how to proceed and what can pass that body," the California Democrat said. "The Senate will vote tomorrow night, and the Congress will work its will." The new approach, announced Tuesday night by Senate Majority Leader Harry Reid, D-Nev., and Minority Leader Mitch McConnell, R-Ky., would tack large and contentious tax measures to the bailout bill. Senate leaders figure the House will have to approve it because the tax cuts are too appealing to Republicans and the financial rescue plan will still seem essential to most Democrats. The Senate approach uses big, game-changing amendments. House leaders earlier were considering the smallest possible tweaks to the bill in hopes of picking up 12 more votes. The previous compromise agreement met stiff opposition in the House, with many lawmakers facing fierce opposition to any bailout deal from their constituents. Just a day after Republican Joe Barton helped kill the bailout bill in Congress, he returned home to his rural Texas district where he received support from his constituents, reports CBS News correspondent Bob Orr. "I think we just ought to start over and come up with a plan that puts the taxpayer first," Barton told CBS News. The Senate bill would raise federal deposit insurance limits to $250,000 from $100,000, as called for presidential nominees Barack Obama and John McCain only hours earlier. House Minority Leader John Boehner, R-Ohio, praised the move, but many Democrats had signaled approval as well. McCain, Obama and Sen. Joe Biden of Delaware, the Democratic vice presidential nominee, signaled plans to return to Washington for the Wednesday night vote. If Obama and Biden vote for the measure, it would make it more difficult for Pelosi and other Democrats to reject or change the Senate measure. The Senate measure will graft the bailout language to a tax bill it approved last week, on a 93-2 vote. It includes: a provision to prevent more than 20 million middle-class taxpayers from feeling the bite of the alternative minimum tax, $8 billion in tax relief for those hit by natural disasters in the Midwest, Texas and Louisiana and some $78 billion in renewable energy incentives and extensions of expiring tax breaks. In a compromise worked out with Republicans, the bill does not pay for the AMT and disaster provisions but does have revenue offsets for part of the energy and extension measures. That wasn't enough earlier this year for the House, which insisted that there be complete offsets for the energy and extension part of the package. The Senate version also may include a measure to require health plans for 51 or more employees to give equal treatment to mental health or addiction if they cover such illnesses. The House and Senate have passed similar mental health parity measures, but none has gone to Bush for his signature. The surprise move capped a day in which supporters of the imperiled economic rescue fought to bring it back to life, courting reluctant lawmakers with a variety of other sweeteners including the plan to reassure Americans their bank deposits are safe. Amid Tuesday's negotiations, Federal Deposit Insurance Corp. chairman Sheila Bair asked Congress for temporary authority to raise the limit on deposits by an unspecified amount. That could help ease a crisis of confidence in the banking system, Bair said. Monday's House vote was a stinging setback to leaders of both parties and to Bush. The administration's proposal, still the heart of the legislation under consideration, would allow the government to buy bad mortgages and other deficient assets held by troubled financial institutions. If successful, advocates of the plan believe, that would help lift a major weight off the already sputtering national economy. Bush renewed his efforts to save the bailout plan Tuesday, speaking with McCain and Obama and making another statement from the White House. "Congress must act," he declared. Though stock prices rose, more attention was on credit markets. A key rate that banks charge each other shot higher, further evidence of a tightening of credit availability. The rescue package was Topic A on the presidential campaign trail. "The first thing I would do is say, 'Let's not call it a bailout. Let's call it a rescue,"' McCain told CNN. He said, "Americans are frightened right now" and political leaders must give them an immediate solution and a longer-term approach to the problem. According to an industry survey, two-thirds of small business owners said they're feeling the impact of the credit crunch, reports CBS News business correspondent Anthony Mason. "There is no extra capital," Jay Cullimore, owner of Tropical Lighting, told CBS News. Cullimore needs that capital to buy holiday inventory for his Florida-based company. "We are a little late on buying. And it's been a little tough to figure how much we can buy. So we're kind of playing it by ear because we really can't get the cash we're looking for." Though the blue-chip index rose nearly 500 points by late afternoon, the main worry for traders is that a lack of a plan will make it nearly impossible for some companies to fund basic operations like making payroll. Participants in the credit market buy and sell debt that companies use to finance operations. The benchmark London Interbank Offered Rate, or LIBOR, that banks charge to lend to one another, rose sharply Tuesday, making it more expensive and difficult for consumers and businesses to borrow money. In addition, credit card debt and more than half of adjustable-rate mortgages are tied to LIBOR, so an increase isn't welcome for many consumers. "I'm not getting the sense that investors are going to be jumping in with both feet until there is some kind of resolution on the plan," said James Maguire, an NYSE floor trader with Christopher J. Forbes. "If there's a no vote, we're going to see a lower overall drift in stocks. It will be a slow bleed." Traders also will likely focus on how the bloodshed will look on paper. Tuesday marks the final session of the third quarter - and what is typically the worst month for the stock market - so some portfolio managers might try to do what they can to dress up their performance. Others might simply wish to dump holdings in an unpopular corners of the market like the financial sector. At the close, the Dow rose 485.21, or 4.68 percent, to 10,850.66 after falling nearly 7 percent on Monday to its lowest close in nearly three years. It was the largest point drop and 17th largest percentage drop in the blue chip index. The percentage decline was far less severe than the 20-plus-percent drops seen in the stock market crash of October 1987 and before the Great Depression. Broader stock indicators also bounced higher. The Standard & Poor's 500 index recovered 58.34, or 5.27 percent, to 1,164.73, and the Nasdaq composite index rose 98.60, or 4.97 percent, to 2,082.33. The yield on the 3-month Treasury bill rose Tuesday to 0.89 percent from 0.14 percent late Monday. The yield fell Monday as investors clamored for the safety of government debt. The yield on the benchmark 10-year Treasury note, which moves opposite its price, rose to 3.83 percent from 3.58 percent late Monday. The dollar rose against other major currencies and gold prices advanced. The Chicago Purchasing Managers' index, which measures business conditions across Illinois, Michigan and Indiana, came in at 56.7 compared with 57.9 in August - a second straight month of a strong reading. Light, sweet crude rose $4.27 to settle at $100.64 on the New York Mercantile Exchange. Oil fell more than $10 a barrel Monday as investors worried that a weaker economy would curtail demand. Advancing issues outnumbered decliners by about 2 to 1 on the New York Stock Exchange, where volume came to a light 1.02 billion shares. The Russell 2000 index of smaller companies rose 22.86, or 3.32 percent, to 679.58. Overseas, Japan's Nikkei stock average fell 4.12 percent. But Hong Kong's Hang Seng index rose 0.76. 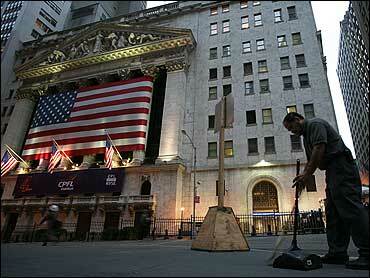 Britain's FTSE 100 rose 1.74 percent, Germany's DAX index added 0.41 percent, and France's CAC-40 rose 1.99 percent.